Excerpt: "Power is embodied in man-woman relationship. Male members of the society enjoy a historical experience of superiority and power, while female populations encounter a historically bitter experience of subordination, powerlessness, and violence against them. From childhood, boys and girls are tainted with superior/inferior complexes respectively as well as associated power and pride in boys and guilt and shame in girls. To maintain the status quo of the subordination of women, the structures of oppression work through the systems and institutions in society— family, educational, political, religious, law – to require that women conform to their traditional gender roles. The perceived gender roles and identities shape the vision and action in all spheres of life. Men as heads of households, husbands, and fathers, and as religious-political-social leaders, gain the power to control woman’s body, her psychology, wealth and property, and space of existence. With their patriarchal structure and gender-biased reflections and interpretation of Scriptures, religions play a vital role in the process of maintaining and transmitting this gender imbalance." Faith at the UN - Gender in the Church, Catherine Bordeau, Emily Davila, Alison Killeen, Rev. Kathleen Stone - Ecumenical Women, 2009. "The UNEP Year Book 2009 presents work in progress on scientific understanding of global environmental change, as well as foresight about possible issues on the horizon. 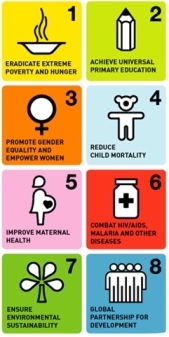 The aim is to raise awareness of the interlinkages among environmental issues that can accelerate the rates of change and threaten human wellbeing. 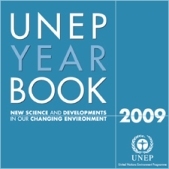 "The UNEP Year Book 2009 examines in six chapters new science and developments, and discusses the cumulative effects expected from degradation of ecosystems, the release of substances harmful to those ecosystems and to human health, the consequences of our changing climate, the continued human and economic loss resulting from disasters and conflicts, and the overexploitation of resources. It calls for an intensified sense of urgency for responsible governance in the face of approaching critical thresholds and tipping points." "Despite much progress since 2000, millions of children, youth and adults still lack access to good quality education and the benefits it brings. This inequality of opportunity is undermining progress towards achieving Education for All by 2015.
Who are these individuals and groups? What are the obstacles they face? 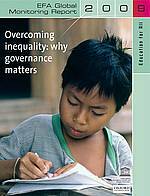 How can governance policies help break the cycle of disadvantage and poverty? What policies work? Is education reform integrated into the bigger picture? Is the international community making good on its commitments?" 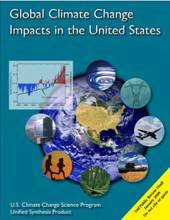 This book was released January 2009 by Palgrave MacMillan. The complete title is The New Economics of Sustainable Consumption: Seeds of Change. It bridges the gap between new economic theories and the new consumption patterns that will be required for sustainable economies to materialize. The author is Gill Seyfang, an Environmental Social Scientist at the University of East Anglia's Centre for Social and Economic Research on the Global Environment (CSERGE). 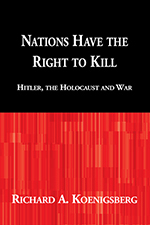 The book conveys a cautious but positive outlook for the future of humanity. It shows that the transition from consumerism to sustainable consumption is only as complex and dangerous as we want to make it. This is a transition that should be faced and managed with due diligence, but without fear. There may be some surprises here and there, but nothing that humans cannot handle. There is no need for some earthshaking technological breakthrough to save the planet from oblivion, nor is there a need for some magic or witchcraft to overcome dark mysteries not accessible to the human mind. 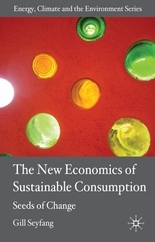 The author argues, persuasively, that the transition from consumerism to sustainable consumption will in fact bring about opportunities for grassroots innovation and the social renewal of local communities, both of which that have been suffocated by the frenzied global growth of recent decades. And citizens in the local communities can still exercise their "global citizenship" via global networks such as the Global Ecovillage Network (mentioned in page 185). The book recognizes the inevitable difficulties, but conveys an attitude of serenity in facing the future. Technically, the content is informative, and the figures are good; but the most useful feature of this book may be the eleven tables that summarize the entire content in a form ready to be used in meetings and discussions. The tables are also amenable to adaptation depending on the audience and local circumstances. Table 1.1 (page 8) on theoretical approaches to consumer motivation, and Table 3.1 (page 62) on indicators of sustainable consumption, are synoptic jewels. This book is highly recommended for personal study and/or teaching at the high school and college levels. The Palgrave points of contact are: Kathryn Treeby (UK), and Alaina Kunin (USA).